At the cutting edge of women's fashion in the 1970s, a visionary young woman subdues her desire for love to remake retail at New York's most glamorous department store. Newly single, Dana McGarry learns she must divorce herself from more than a bad marriage to succeed. Not only must she prove to family and friends that she can make it on her own, but she also must challenge an antagonistic boss who keeps standing in her way. Moving out of her comfort zone and into the arms of a dynamic businessman, Dana bets it all on a daring new move that will advance her buying career, But at what price? Her dreams within reach, Dana's world is shattered in a New York minute when a life is threatened, a secret is revealed, and her heart is broken. We're all on a journey and you need to always return to who you are deep down inside. You have to take care of Dana first. Does that make sense? I do feel like I'm taking good care of myself for the first time in years. I feel connected to work in a new and exhilarating way, and I also feel that I have struck a better balance between my career and my life outside of work, a subject we spoke of early on. Mark, as much as we care for each other. I can't let you make this decision to appease me. I don't want the burden of knowing I was responsible for your giving in to Marsha's demands, which you've already explained are unacceptable. "April Snow" is the second book in an exciting new series by successful business woman turned author Lynn Steward. The setting is New York City in the 1970's when woman were just starting to have some impact on the business world. Dana McGarry is one of these women. In this story, we are re-acquainted with Dana McGarry who works for a popular department store in downtown Manhattan. The author easily takes us back to 1970s Manhattan, home of the sophisticated and the elite. She takes us back to a time when women were just entering the work force, a time when a women had to fight 100x harder than a man, just to be noticed. Dana is finding herself at a crossroads. Will she make the right decisions and stay true to herself and her vision or will she allow others to crush her dreams? This was such a wonderful read! It reminded me of novels I read years ago by Barbara Taylor Bradford, Judith Krantz and Penny Vincenzi. Female readers will no doubt empathize with Dana as she struggles to keep her career and relationships together. She is strong, but also caring and sensitive. Readers will also be swept away by the setting. With vivid detail, the author brings 1970s New York City alive in all its splendor. I really felt transported in time and place, felt the hustle and bustle of a true New York setting. The characters are sympathetic and very relatable. The second book in this series has started off where the last one ending and it is just as interesting and well written as the first. Steward has created a wonderful world of drama in this new series. If you are like me and you love women's fiction and are a fan of strong female protagonists, I recommend you pick this one up. Lynn Steward is giving away a signed paperback edition of "April Snow"
Lynn Steward is a successful business woman who spent many years in New York City's fashion industry in marketing and merchandising, including the development of the first women's department at a famous men's clothing store. Through extensive research, and an intimate knowledge of the period, Steward created the characters and stories for a series of five authentic and heartwarming novels about New York in the seventies. 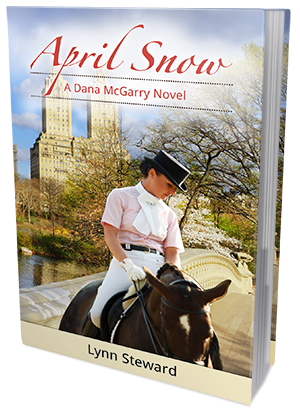 April Snow is volume two in the Dana McGarry Series. A Very Good Life, Steward's debut novel, was published in March 2014.